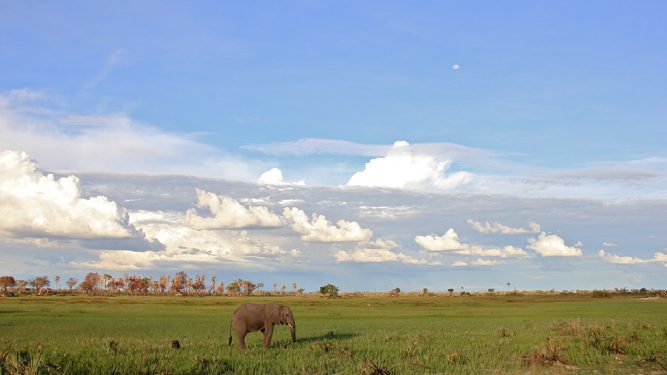 It was my first week managing a camp on the southwestern edge of the Okavango Delta. I was understandably wary. Not only would I have to learn to negotiate unchaperoned night walks home, drive a Land Rover on roads that often struck uncanny likenesses to rivers, identify the chiming, screeching, bellowing creatures of the day and night - I would have to do it all with the air and ease of a seasoned pro. On one of my evening walks home, I met the unaffected gaze of a buffalo in my path. However placid he appeared, munching the green grass, these herbivores are notoriously shifty and charge without warning. I could wait until he was finished grazing and carry on walking or brave the creaky utility vehicle, driving the perimeter of camp to my tent instead. I turned the key and the 4x4 started with a gravelly cough. I couldn’t manage to find the headlights so I set out with only the light of my torch from the open window. Crawling over the waves of thick sand in first gear, finally I flicked on the lights. That instant, passing through the light of the beam, a dappled figure plummeted to the ground meeting forms with a tiny buck, overwhelming it, and running away as one. I didn’t have time to touch the brakes. 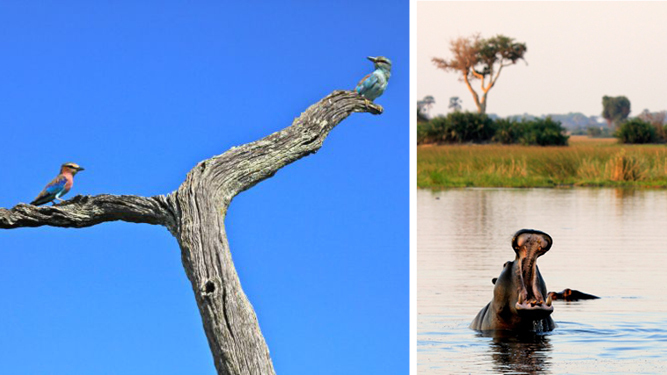 The Delta offers diverse sensory experiences: big game sightings coupled with incredible landscapes & spectacular views. The more experience I gain out here, the more experiences are bound to subvert my expectations. In other words, the more we know, the more we realise what we don’t know - it’s what keeps us coming back for more. It's all about being in the right place at the right time. If ever there was a right place, this is it. 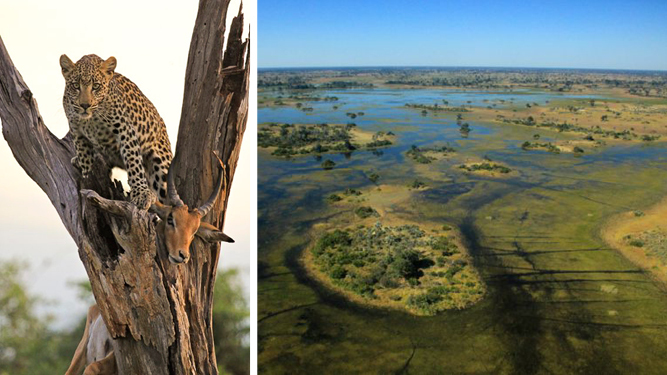 The Okavango Delta was named the one-thousandth World Heritage Site in July 2014 for its superb biodiversity. It is the world’s largest and Africa’s only freshwater inland delta, stretching over 16 000km² or 6 180mi². 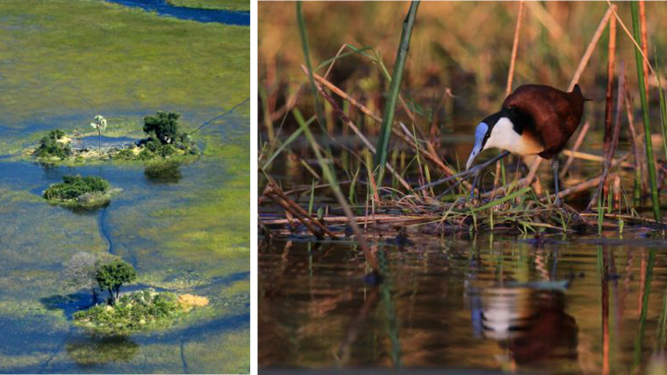 Of the seven most globally important wetlands, you can see more species of birds and reptiles in the Okavango than any other, along with the second greatest variety of plants and mammals. The unique synthesis of natural habitats push plants and animals to occupy ecological niches, essentially adopting unorthodox habits. You can see lions swimming on a hunt; red lechewe and sitatunga antelopes that have adapted to life on the flood plains; grasses that spend four months of the year inundated with flood water; and birds like the African jacana, which lays its eggs on floating nests. The freshwater Delta is a birder's paradise! This blue-headed jacana is also known as a lily-trotter. Locals might equivocate somewhat when asked for clues about the ‘must-sees’ of the Delta; it’s only because we know something remarkable can be seen here anywhere, anytime. For me, there’s nothing more profound than sensing the waters creeping in. Everyone has their wagers of how high and when and then, one day, rain that fell in the Angolan highlands, 1 500km or over 930 miles away, finally makes its way to your front door. 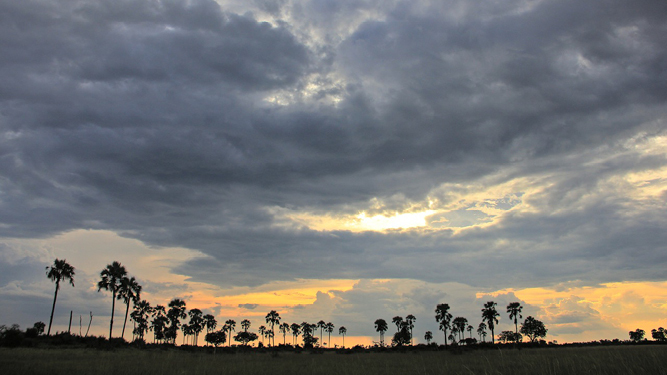 Dramatic skies & bursts of rain are characteristic of Okavango summers. If ever there was a body most able to live out a calling, indeed it is that of an African wild dog. Colloquially known as the painted wolf for their tremendous black, gold and white markings, they are spectacle enough at stand-still. But the greatest thrill to be had in the bush is trying to following a blitz of them on a hunt. They stream out like a mad current, sussing out every angle and direction. 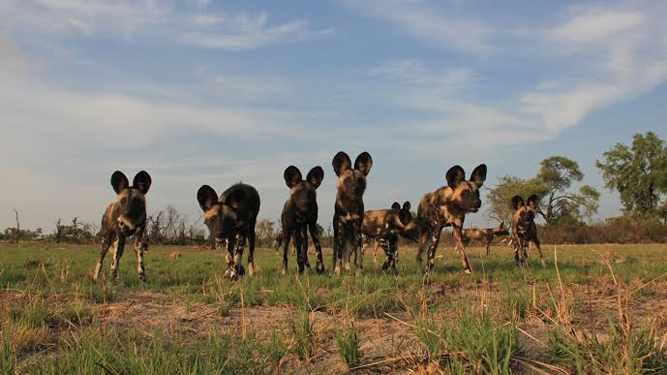 African wild dogs flourish in the Okavango Delta; their pack mentality ensures survival even in the dry season. Maybe it’s just me but I get a surge of excitement recognizing that my seasonal neighbours have returned: the European rollers that settled into the decapitated lala palm last year, or the carmine bee eaters that can deck out even the dullest of trees with their magnificent fuchsia. To come here is to come to a fuller experience of even your own senses, to become acutely aware of sounds and smells, signs of the bush and their meanings. The cry of the African fish eagle by day and low ‘hoo, hoo’ of a giant eagle owl by night. The persistent base of the ground hornbill at dawn. You learn to distinguish between baboon banter and a warning call that a predator is nearby. From tiny lilac-breasted rollers to grunting hippo pods, the Okavango Delta has life in abundance. Often the surreal encounters have something to do with luck but a well-timed visit might just tip the odds in your favour. Predators are active year around but during the dry season, roughly from May to November, they follow the seasonal migrations of herbivores that are attracted to what remains of water sources. As much as it possesses impressive and extensive game to rival any bushscape, what sets the Delta apart is the water. You can amble around on a game drive then take a speedboat down a switchback channel or go for a lazy cruise on a traditional mokoro, a dugout canoe. Water is what makes the Okavango elephants such exceptional specimens to observe. Whether it’s a big bull grazing in a channel in front of your boat, a whole family cooling off in a lagoon or the sound of a herd crossing the flood plains - there’s something about witnessing the largest land mammal submerging itself that seems especially joyful. Summer months mean endless green plains & ever-changing skies. During the summer months migratory birds return and the landscape is green and lush. New life abounds: baby antelope, zebra and wildebeest are all negotiating life on four legs. But there’s no one best time to witness the Delta from above. From the skies you can begin to comprehend how the whole patchwork scheme of rivers, channels, islands and plains fit together or momentarily keep pace with a hippo bounding along the bottom of a channel. 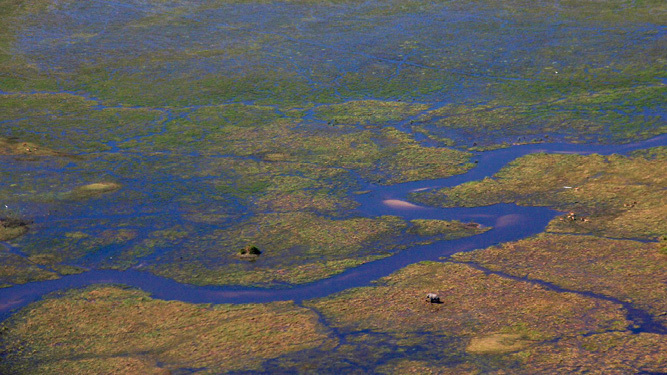 The Okavango from above - can you spot the elephant? When you come here, you would do well to suspend all your preconceived notions of Africa. Succumb to the present: to the sheer size and splendour of this wilderness. There is no perfect moment to experience rapture and no amount of engineering on your part can invite it - it’s best experienced spontaneously. Last year, at the end of the flood season, in the hot, before-rain days of November - considered by some as the most unpleasant time to visit the Delta because of the intense temperatures - we were sitting around the campfire drinking gin and tonics, musing about the day and the heat. As we sat, through the soft scattered glow of lanterns, we could see a line of elephants approaching. All of us froze. They stepped even closer until they were beneath the giant sycamore fig flourishing with fruit, huddled around the base just a few metres away. No doubt they were keenly aware of the glowing fire and the bodies surrounding it and, yet, they were totally at ease. No one reached for a camera or took another sip from their drink. This was it: an instant flooded with surprise and awe, where we had no choice but to be steeped in the moment.